Identification of a sequence of east-west trending magnetic anomalies of Mesozoic age in the western Somali Basin helps define the position of Madagascar in the Gondwana reconstruction. The anomalies are symmetric about ancient ridge segments and are flanked to the north and south by the Jurassic magnetic quiet zone. 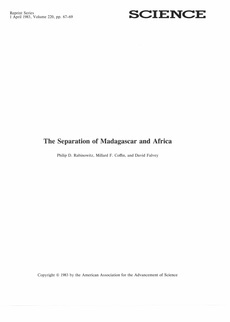 The motion of Madagascar relative to Africa was from the north and began in the middle Jurassic, about the same time as the initial breakup of Gondwanaland. Sea-floor spreading ceased when Madagascar assumed its present position in the Early Cretaceous.